I can’t shop at Whole Foods very much at all but it’s a yuppy pleasure to stroll around the store that has a carefully created market feel. Usually I breeze through the produce section–I buy practically nothing organic–and skip to the bakery and prepared foods section. But one day, I was looking more carefully at the general offerings because I wanted to smash through a few more items on the Vancouver Things to Eat Before You Die Lists [2008,2009]–it turns out the contributor also strolled through Whole Foods for inspiration, having the grocer pre-screen his/her ultimate selections. For example, bakery items from Butter, Swiss Bakery, and Vancouver croissant appear on the list but they are all coincidentally found at Whole Foods…. Anyways, that’s the day I browsed and stopped at the chilled tofu section to see what, ahem, Caucasian people offered for healthier and innovative tofu creations. I was pleased to find tubed tofu for a reasonable price although the selection is limited to just one kind. And I also couldn’t help but notice the tofu noodles. The spaghetti shape seemed the most safe so I bought one package, just $2.39. A couple of weeks later, it was time to try out the noodles. As part of reading the preparation instructions, I was beyond pleased to learn the entire package of noodles (2 servings) was just 40 calories! The instructions said to drain and rinse the noodles thoroughly and then microwave for 1 minute or boil for a couple minutes to get rid of the “authentic aroma”. That is a highly diplomatic way of saying “smells like dead fish”! Their precaution helped and I took the microwave route, being too lazy to lose the noodles in a boiling pot of water. Then I fried up some garlic and liberally seasoned the tofu noodles with chili sauce and Maggi seasoning. 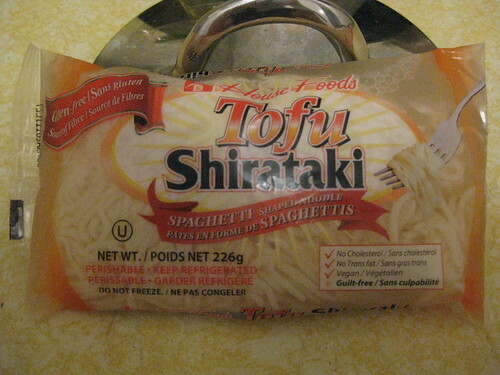 Even before trying them, and besides being loathed to open a new jar of pasta sauce for such a small serving, I couldn’t fathom using tomato sauce on tofu-based noodles. As you see below, it is hardly anything to look at since I hadn’t even thought of adding greens. They were really good, the noodles have a satisfying crunch to them and were ultra light.